This beautiful poem by Kathleen Raine (picture from here) is not a conventional romantic poem to a lover. To My Mountain is about a love of landscape, of a place, that the poet obviously knows well. But I wonder if she's not also addressing a human lover using the metaphor of the mountain to express the pain of unrequited love? I've dipped into Raine's poems & autobiography over the years but I would like to read more of her work. 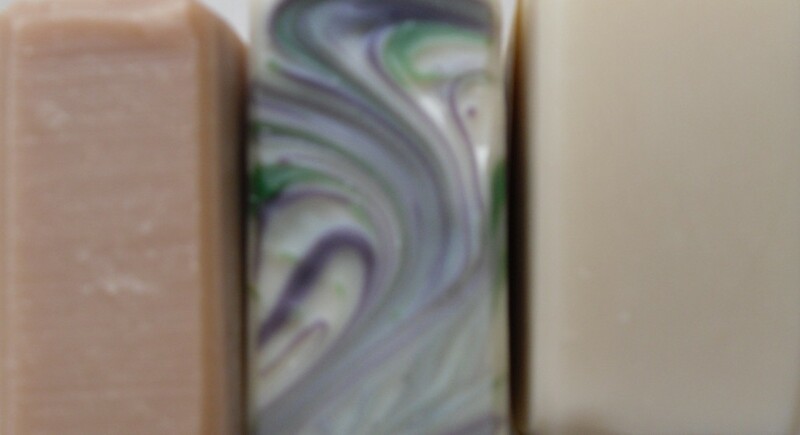 and, oh, the sweet scent, and purple skies! Jane Eyre is one of my favourite books. I've read it at least 20 times &, after seeing the latest movie adaptation last weekend, I had to read it again! My original 1970s Penguin paperback is so fragile that I had to buy a new reading copy a couple of years ago. I enjoyed the new movie version. The music was beautiful & I thought Mia Wasikowska was very good as Jane. It's so difficult for an actor to convey Jane's passion as outwardly she's so quiet & still, but she did a good job. The first person narration of the novel is full of fire & passion but it's almost all interior. I was less excited by Michael Fassbender as Rochester. I liked the structure, it begins in the middle of the story as Jane leaves Thornfield after the aborted wedding & uses flashbacks to show her childhood. I was pleased that the later section of the book at Morton with the Rivers family was there because that's often left out of a 2 hour movie. But, what I noticed most was the dialogue. They used some of the original dialogue & conflated some scenes but changed quite a bit where I thought they should have left Charlotte Brontё's words intact. I sat there hearing the original words from the novel in my head & I could hardly wait to get home & start reading the book all over again. 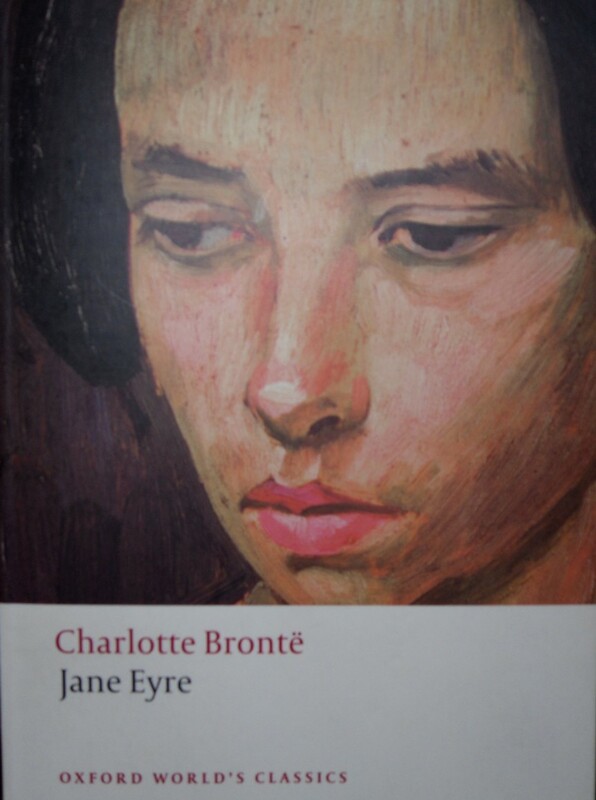 Jane Eyre is the story of a passionate, uncontrolled child who grows into a passionate, controlled woman. Jane is an orphan, left to the care of an unfeeling aunt & cousins. She is sent to a charity school, Lowood, where she is first starved & neglected but eventually gains an education. She becomes governess to the ward of Edward Rochester of Thornfield Hall, an abrupt, ugly but fascinating man. Jane falls in love with her employer but he seems to favour a beautiful, haughty woman, Blanche Ingram. There are also mysteries at Thornfield. Jane hears strange laughter from the upper stories, Rochester is nearly burnt in his bed in the middle of the night. A visitor from Jamaica arrives & is stabbed in mysterious circumstances. Rochester proposes to Jane but their wedding is interrupted by the revelation that Rochester is already married. Jane leaves Thornfield after refusing to become Rochester's mistress & wanders, starving, on the moors for three days before being taken in by a clergyman, St John Rivers, & his sisters. Jane becomes a village schoolmistress until she receives an inheritance & discovers that she does have a family with whom to share it. She cannot rest until she discovers what has happened to Rochester & so she returns to Thornfield Hall. I tried not to reveal too many spoilers in that summary but surely there can't be too many people who don't know the story. When I reviewed Villette recently, I said that it's the narrator's voice that is so beguiling. So, I'm just going to quote some of my favourite passages. Jane's time at Lowood is famous because it's based on the experiences of Charlotte & her sisters at the Cowan Bridge School. Her two eldest sisters, Maria & Elizabeth, left Lowood suffering from tuberculosis & went home only to die. The chapters at Lowood are so searing in their condemnation of Mr Brocklehurst & his version of Christian charity, so horrifying in the depiction of mental cruelty & bodily suffering, that the fact that this period of Jane's life up to the death of her friend, Helen Burns, is only about the first few months of her time there, is often forgotten. 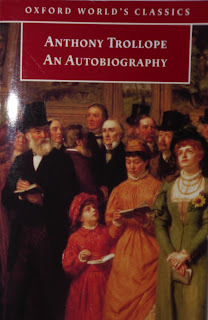 The chapter after Helen's death skims over the next eight years of Jane's life as a student & teacher at Lowood until the day when her kind friend & mentor, Miss Temple, marries & leaves. I went to my window, opened it, and looked out. There were the two wings of the building; there was the garden; there were the skirts of Lowood; there was the hilly horizon. My eye passed all other objects to rest on those most remote, the blue peaks: it was those I longed to surmount; all within their boundary of rock & heath seemed prison-ground, exile limits. I traced the white road winding round the base of one mountain, and vanishing in a gorge between two: how I longed to follow it further!...I tired of the routine of eight years in one afternoon. I desired liberty; for liberty I gasped; for liberty I uttered a prayer; it seemed scattered on the wind then faintly blowing. I abandoned it , and framed a humbler supplication; for change, stimulus: that petition, too, seemed swept off into vague space; "Then, " I cried, half desperate, "Grant me at least a new servitude!" "I tell you I must go!" I retorted, roused to something like passion. "Do you think I can stay to become nothing to you? Do you think I am an automaton? - a machine without feelings? and can bear to have my morsel of bread snatched from my lips, and my drop of living water dashed from my cup? Do you think, because I am poor, obscure, plain, and little, I am soulless and heartless? - You think wrong! - I have as much souls as you, - and full as much heart! And if God had gifted me with some beauty, and much wealth, I would have made it as hard for you to leave me, as it is now for me to leave you. I am not talking to you now through the medium of custom, conventionalities, nor even of mortal flesh: - it is my spirit that addresses your spirit; just as if both had passed through the grave, and we stood at God's feet, equal - as we are!" "As we are!" repeated Mr Rochester - "so," he added, enclosing me in his arms, gathering me to his breast, pressing his lips on my lips: "so, Jane!" Finally, when Jane has fled Thornfield & ended up at Morton with the Rivers family, she rejects St John's cold proposal that she should marry him & go with him as a missionary to India. "Jane! Jane! Jane!" Nothing more. "Oh God! what is it?" I gasped. I might have said, "Where is it?" for it did not seem in the room - nor in the house - nor in the garden: it did not come out of the air - nor from under the earth - nor from overhead. I had heard it - where, or whence, for ever impossible to know! And it was the voice of a human being - a known, loved well-remembered voice - that of Edward Fairfax Rochester; and it spoke in pain and woe wildly, eerily, urgently. "I am coming!" I cried. "Wait for me! Oh, I will come!" I flew to the door, and looked into the passage: it was dark. I ran out into the garden: it was void. The hills beyond Marsh-Glen sent the answer faintly back - "Where are you?" I listened. The wind sighed low in the firs: all was moorland loneliness and midnight hush. Every time I read Jane Eyre, I find something new in it. Every time I watch a TV or movie adaptation, I want to read the book again because no adaptation can ever really satisfy. My favourite is the 1980s BBC version with Zelah Clarke & Timothy Dalton. There was real chemistry between them & they used lots of the original text. I may have to find time to watch it again! 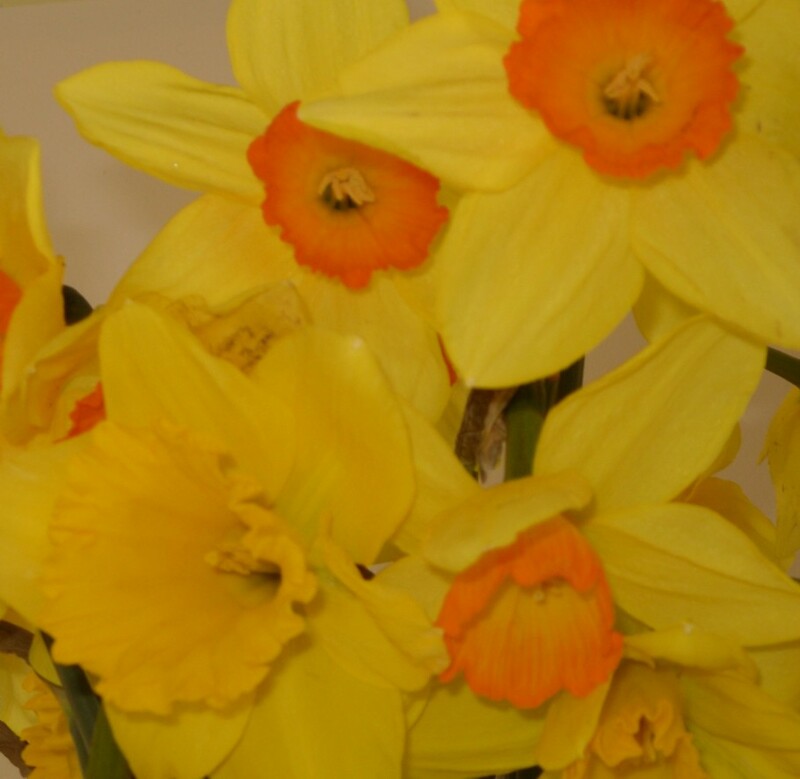 Today's Scottish love poem is one of the most famous poems by the most famous Scottish poet. 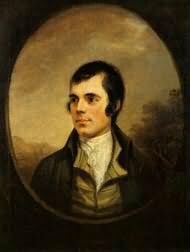 Robert Burns (picture from here) wrote some of the lightest, loveliest love lyrics in the language & I always hear this one in my mind as a song, traditionally sung to the tune of Common Frae the Town. Well, 10 days after moving in, Phoebe & Lucky are relaxed & feeling more at home. I still haven't taken them outside & I'm worried about Phoebe as she's such a daredevil, loves climbing & I'm concerned that she'll wander. 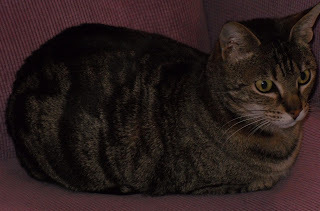 I never had to worry about Abby because she was an elderly cat when she came to live with me & never climbed further than my lap. 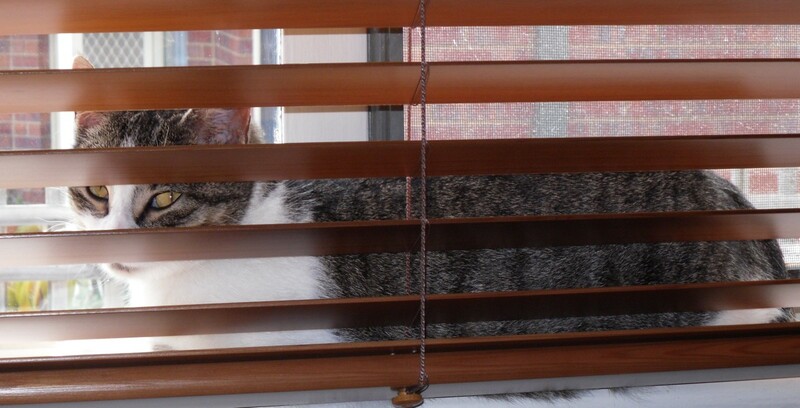 Phoebe has been on top of the laundry cupboard, the fridge & the top of the blinds in the lounge room as well as sitting on every window sill in the house as you can see. 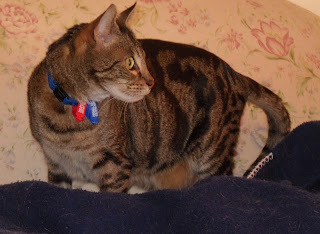 Lucky is much calmer. 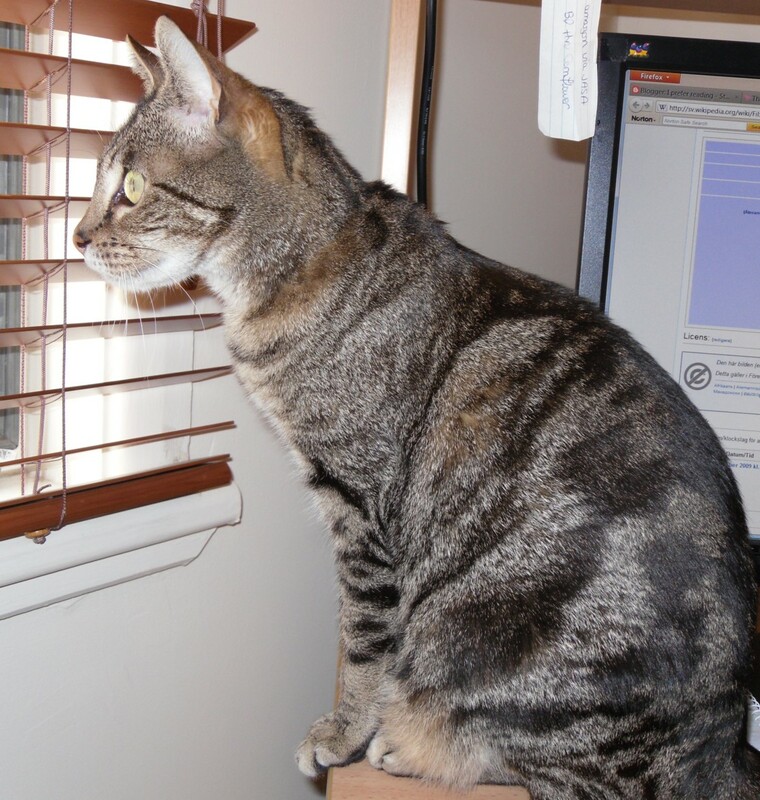 She also enjoys looking out the window but from a more sedate distance. She loves sitting on the TV unit (notice the expensive but neglected cat tree in the background). 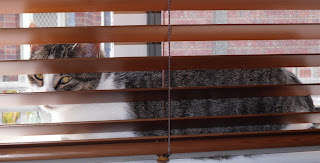 They do use the cat tree as a scratching pole which is great but neither of them want to sit on it, although I think Phoebe used it as a launching pad for her trip to the top of the blinds this morning. Lucky loves sitting on my lap. As soon as I sit down, she's there. I try to give Phoebe some lap time when Lucky's asleep in her other favourite spot, burrowed into Abby's old rug . It must be a need for security as she loves burrowing right into it. I've also rearranged the furniture so there's room for Phoebe to curl up on her blanket next to me in the evenings when Lucky's on my lap. 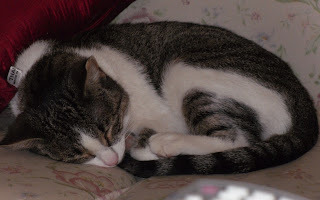 (Phoebe's half-asleep on my lap at the moment). They've been getting on quite well together. 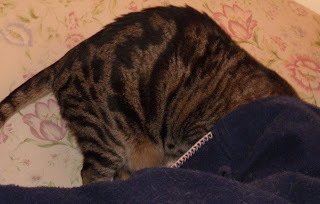 A few spats & Phoebe likes to play when Lucky isn't in the mood but they've been rubbing noses as well. They both love chasing after little balls with bells in them although Phoebe's broken the feather on a stick already! I may be able to fix it with a strong elastic band... So, apart from my worries about letting them outside, we're getting on very well. I went back to work on Monday & they seem fine left alone all day. Happy to see me at night, of course, because they know it's dinner time. As to books, well, I'm reading Sir Walter Scott's The Talisman with my 19th century book group. It's one of his tales of the Crusades &, after a slow start, it's become quite exciting. Lots of conflict & tension in love & war. 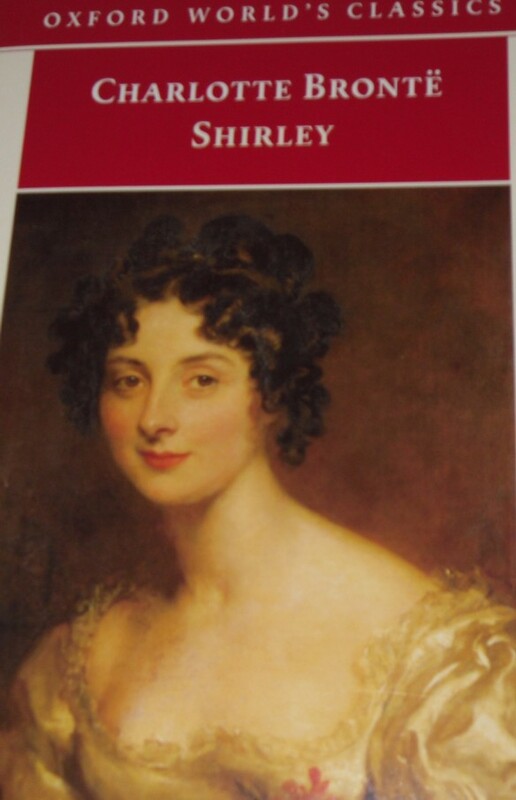 I'm also halfway through Maria Edgeworth's The Absentee, about a young man exploring his Irish heritage in early 19th century England & Ireland. Lots of social comedy & a romance that seems doomed but all may not be lost. I hope to finish it tomorrow. This afternoon I'm off to see the new version of Jane Eyre at the movies. The reviews have been quite good so I hope it's a good adaptation & they've used lots of the original dialogue! On a sunny morning in the midst of the Second Dark Ages, Flora and Charles Fairford were seated at breakfast on the vicarage overlooking the Regent's Park where they had lived since Charles's ordination thirteen years ago. Flora, it may be remembered, had been Flora Poste noted for the straightness of her nose and the efficacy of her restorative work at Cold Comfort Farm in Sussex. The nose retained its classic elegance; the work she seldom thought of nowadays, for Flora had five children. The post had just arrived, and the family party were occupied in reading its letters. One of Flora's letters is from Mr Mybug, the pseudo-intellectual poseur she encountered all those years ago whose favourite theory was that Branwell Brontё had written Wuthering Heights. 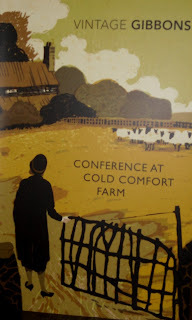 He asks Flora to help him run a conference of the International Thinkers Group to be held at Cold Comfort Farm, no longer a farm but a conference centre run by a Trust that buys rundown houses & renovates them in true olde worlde style. At tea with Mary Smiling, the brassiere-collecting friend of her early days & an awful woman called Ernestine Thump, Flora decides to take up Mr Mybug's offer & return to Cold Comfort Farm. On arrival she is met by her cousin, Reuben Starkadder, & he tells her the dreadful news that there are now no Starkadders at Cold Comfort. All the boys have gone off to farm in South Africa, the girls are working at the Centre as cleaners & cooks, Judith is living with a cult, Seth is a balding movie star in Hollywood & Amos is in America preaching at his very own Church of the Quivering Brethren. Reuben couldn't keep farming to meet the standards of the interfering Ministry & was forced to sell. All he has left is Ticklepenny's Field. He were a Mr Parker-Poke. He sets up his bed down at Th' Condemned Man (Mrs Murther, honest soul, nigh kills him wi' her cookin' for th' farm's sake, but o'course she dare not finish un off quite), an' ivery day un comes up to th' farm an' de-dottles me wi' advice. There were no peace, an' things did go from bad t' worse. He - he did say as I were niver agricultoorally eddicated. Flora is dismayed by the prettification of Cold Comfort. Her favourite sitting room is now called The Quiete Retreate & other rooms have been renamed The Lytel Rush-dippe Roome, the Greate Bedderoome & the Greate Scullerie. She decides to get the Starkadders back to Cold Comfort Farm. Stella Gibbons is poking fun at the pretensions & absurdities of post war Britain. The guests at the conference include the modern artist, Peccavi, the monumental sculptor, Hacke, Messe, the Transitorist craftsman & a mysterious sage known as the Master. There are Swedish Existentialists & a modern composer who plays themes from his latest opera at great length during a Reading Picnic on the downs. The satire of these pretentious types is funny but for me, the delight is in revisiting the Starkadders & their friends. Elfine Hawk-Monitor is still beautiful, the mother of a large family & still writing not very good poetry. Urk is still irksome. Best of all, Adam Lambsbreath returns to hunt for his liddle mop which has gone missing. Adam now works for the Hawk-Monitors & the cows are called Mishap, Mislay, Misdemeanour & Mistrust instead of Feckless, Graceless, Aimless & Pointless but he's just as daft as ever. It's a short book, only 150pp, but just long enough. In the Introduction, Lynne Truss says that Gibbons longed to return to the Starkadders, to recapture the spirit of her first big success. I was very happy to revisit the Starkadders with her. 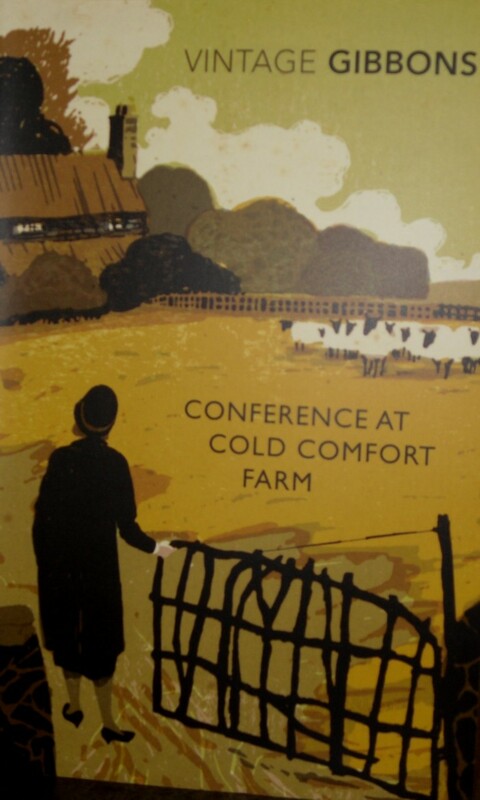 Conference at Cold Comfort Farm can't compare to the glorious original but it's a funny, affectionate book that made me laugh several times & smile very often. 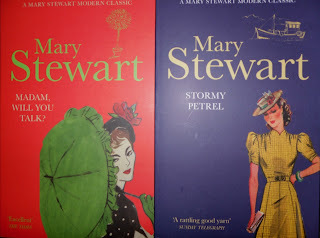 I bought several of the lovely new Mary Stewart reprints a few months ago. I think I read all of her books when I was a teenager but I'd weeded all my old paperbacks long ago so I was ready for a reread. 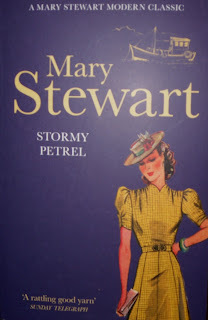 Being in the mood for all things Scottish at the moment, Stormy Petrel was the one I chose. Rose Fenemore is a Cambridge academic & writer. She sees an advertisement for an "ivory tower" to rent on a Scottish island just when she's feeling the need for a holiday & arranges to rent the cottage with her brother, Crispin, a doctor who also loves wildlife photography. 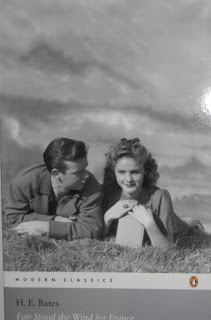 Rose travels up to Moila in the Hebrides on her own with Crispin to join her in a few days. She soon feels at home in the cottage, Camus na Dobhrain, in a remote location but not far from the Big House, Taigh na Tuir, the House of the Tower. The House has been empty since the last owner, Mrs Hamilton, died. Crispin is delayed by a train accident but Rose is content to write, walk & explore the island. On a stormy summer night, two men come in from the sea & take refuge at Rose's cottage. The first, Ewen Mackay, has a key & lets himself in, much to Rose's surprise. Ewen's foster parents had once lived in the cottage but he's been travelling for years & didn't realise they'd moved away. Then, just as Rose is coming to terms with her first intruder, a knock at the door brings another. John Parsons is a geologist camping nearby while he examines a rock formation on a nearby broch or rocky island. His tent was blown away in the gale & he was lost until he saw Rose's lights. Except that his name isn't really John Parsons & Ewen Mackay's charm can't hide the fact that he has secrets of his own. The more Rose discovers about John Parsons who is really Neil Hamilton, the heir of the old lady from the House, the more intriguing he seems. Neil has to decide on the future of the estate & the only offer he's had so far is from a man who wants to turn it into a conference centre & resort. Ewen Mackay's story is well-known to the locals & they're not too happy that he's returned. He was a wild boy who became a con artist & ended up in prison. Why has he returned to Moila? As Rose finds out more about both men, she has to decide who to trust. I think Mary Stewart's Scottish books are her best. She really knows & loves the landscape. The island is lovingly described, I felt I was there, especially as Neil & Rose explore the broch, accessible only by a causeway that's cut off by the tide & home to innumerable midges & a colony of thousands of birds. The Big House, with its overgrown garden & overturned statues of Echo & Narcissus, is like Sleeping Beauty's castle, waiting for the right moment to awaken to life.The romance is gentle & tentative but it's the mystery of Ewen Mackay & his reasons for returning to Moila that really drive the plot. This is perfect comfort reading. A hauntingly beautiful setting & interesting characters add up to a very satisfying afternoon's reading. A short poem but a lovely one today. George Mackay Brown (photo from here) was an Orkney poet & writer. I know Desperate Reader is a big fan, here's just one of her posts about him, but I haven't read much of his work. Only a little poetry & a few short stories. I'm reading quite a bit of Scottish history & fiction at the moment as well as this lovely anthology of Scottish Love Poetry so I may have to investigate Mackay Brown further. This poem, Fiddler's Song, appealed to me because it reminds me of an old ballad like The Unquiet Grave or The Demon Lover. Especially the last line with its practical bluntness. I wonder if the speaker has designs on the mourning lady himself? The storm is over, lady. The sea makes no more sound. What do you wait for, lady? His yellow hair is drowned. Like sheep into the fold. His kissing mouth is cold. I've had a very exciting few days as I've adopted two cats, Lucky & Phoebe. I knew when I lost Abby in May that I would have to get another cat, preferably two so they could be companions for each other while I'm at work. 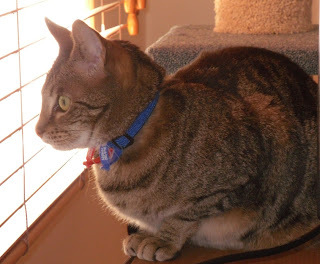 I took a few days off work last week just to have a break & also because I was ready to look for my cats & I wanted to have a few days at home with them so we can get to know each other. I went to the Animal Aid shelter at Coldstream on Tuesday to visit the cattery & see who might want to come home with me. 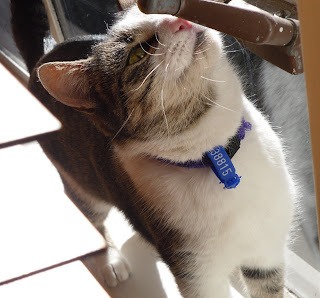 They have a lovely website with lots of photos, videos & information on the cats (& dogs) available for adoption. 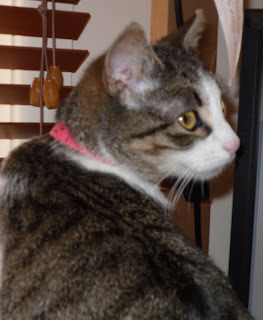 I was looking for older cats as I know they can be hard to find homes for but I really didn't have any ideas except that I didn't want kittens. Lucky is 3 1/2. 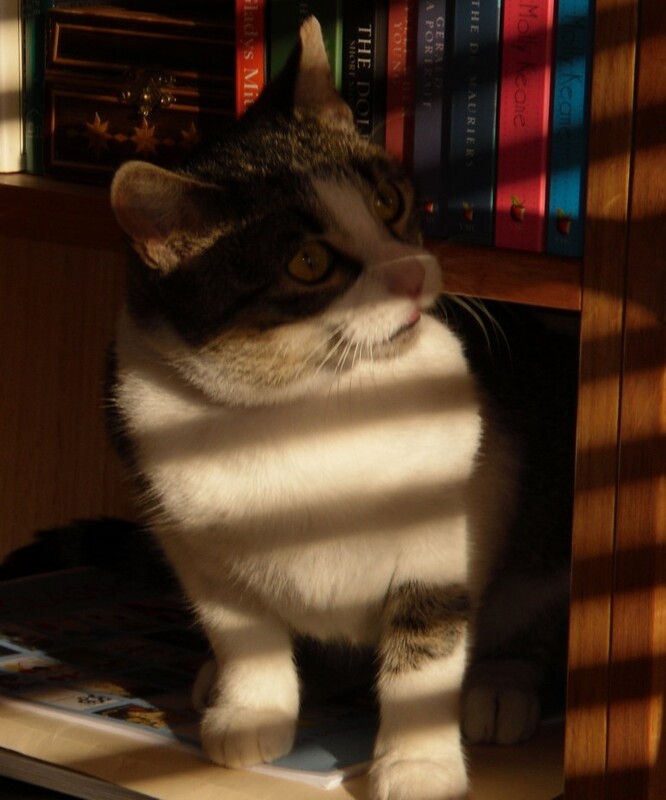 She was left at the shelter when her owners moved house. She had been an outdoor cat, locked in a shed at night & seeing her curled up in a basket in front of the heater just made me want to take her home straight away. I felt she hadn't had a lot of affection in her life so far. She came right up to me & rubbed against me & was happy to be patted & talked to. She's a tabby with gorgeous green eyes. I haven't been able to get many photos of her because she's either been sleeping under my bed or right next to me, following me around or sitting on my lap. She's on the desk as I'm writing this, looking out of the window. She loves looking out the window, as you can see here. I set up a cat tree with platforms & a scratching post near the front window & they've both been on that but Lucky is just as happy sitting on the TV unit watching the birds & the dog walkers going by. 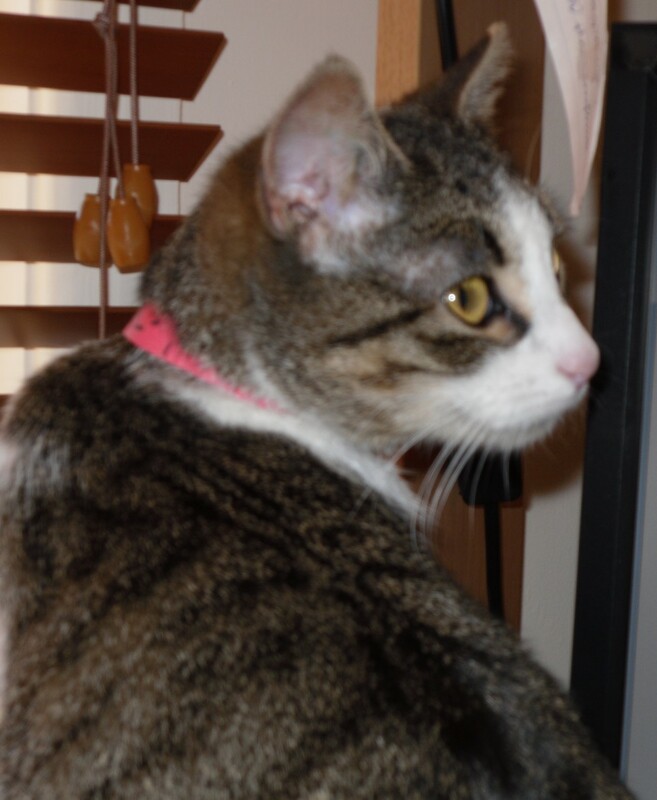 Phoebe is just over 12 months old & is already the daredevil, mischievous one of the pair. I have lots of photos of her because she's always on the go. 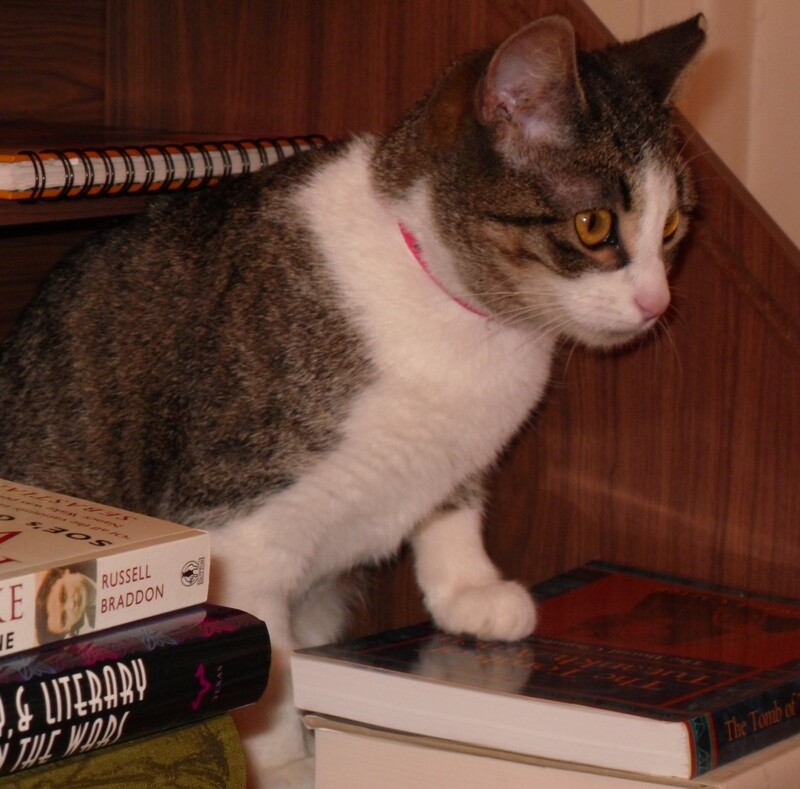 Here she is on the computer desk just before she jumped over to my rolltop desk & inspected the books. Then, she thought climbing the bookshelves was a good idea. Luckily she can't get very high, too many books! I think she looks quite a bit like Abby which is probably what attracted me to her. She also loves being up high. While Lucky loves my lap, Phoebe has decided that laying along the top of the chair behind my head is pretty cosy. Keeping Phoebe off the kitchen bench is my big challenge at the moment. She does sleep though as you can see. Usually when she's exhausted herself running after the ball I throw around for her or trying to eat the feather on a stick. They came home on Thursday & spent the first afternoon exploring the house & getting to know me. They're a bit wary of each other. There have been a few spats but they've also rubbed noses a few times & I'm trying to give them equal time so I hope they'll get along. It's lovely having someone to talk to & it's been great to have time to get to know them a little. We haven't ventured outside yet, probably next weekend. I can't wait for some warmer weather so I can get some photos of them in the garden. It's just as well I'm going back to work on Monday, I could quite easily stay home all the time with these two to play with. 2011 is the 200th anniversary of the publication of Jane Austen's first novel, Sense & Sensibility. I've read it 3 or 4 times over the years but it's been a while so I was pleased to have the anniversary to prompt yet another reread. Sense & Sensibility is probably my second favourite Austen after Persuasion. I love my old 1980's Penguin paperback with the portrait of the Linley Larks by Gainsborough on the cover. Elizabeth (who married Richard Brinsley Sheridan) & her sister Mary were famous singers & actresses in the late 18th century. This is how I always imagined Elinor & Marianne. Even after the 1990's movie, I still see them this way although I found I had the music from the movie in my head as well. One of the loveliest movie soundtracks ever, I think. It's hard to review such a famous novel. 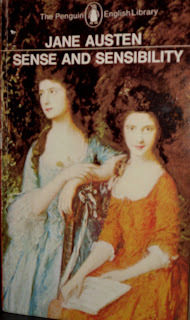 The story is that of two sisters, Elinor & Marianne Dashwood. 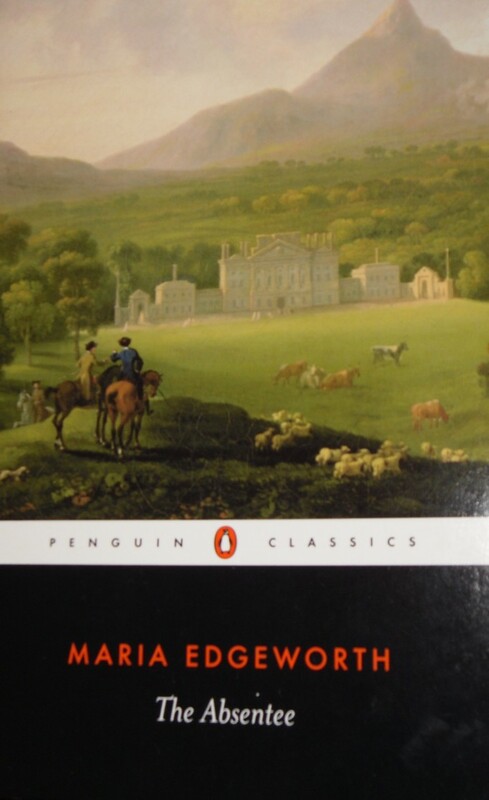 Left very badly-off after their father's death, Elinor & Marianne, with their mother & younger sister, Margaret, must leave Norland, the family estate & eventually rent a cottage in Devonshire, part of the estate of Mrs Dashwood's relation, Sir John Middleton. Elinor, calm & prudent, has met her sister-in-law's brother, Edward Ferrars, at Norland & they have formed an unspoken attachment. Marianne is all sensibility, all romance & when she meets the dashing John Willoughby, she is ready to fall passionately in love. Sir John Middleton is a hospitable man with a very boring wife & a vulgar, garrulous but kind-hearted mother-in-law, Mrs Jennings. Sir John's friend, Colonel Brandon, is immediately attracted to Marianne but she dismisses him as a virtual invalid. He's in his 30s & wears a flannel waistcoat, his life is practically over. Willoughby is young, handsome, drives a curricle & is just as passionate about Shakespeare's sonnets & dancing as Marianne could desire. Their absorption in each other makes them a source of gossip to Sir John & Mrs Jennings & concerns Elinor, who hopes they are engaged but has no definite information from either of the lovers. Elinor is also hoping to hear from Edward but knows that his mother & snobbish sister, Fanny, would not welcome the match. Elinor's hopes are dashed when she learns from Lucy Steele, a young relation of Mrs Jennings's that she has been engaged to Edward herself for four years. When Willoughby suddenly leaves Barton without explanation & is soon after heard of courting a young heiress, it seems that both Elinor & Marianne will never have their heart's desire. 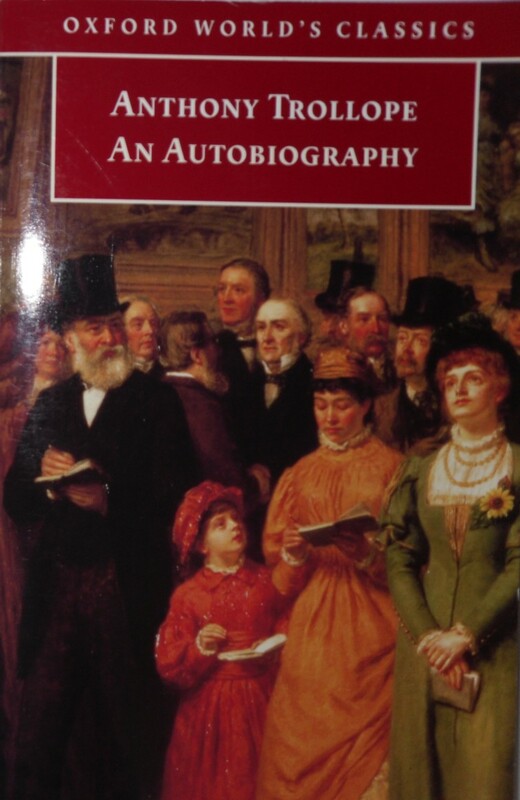 A brief plot summary can never give the flavour of Austen's witty, romantic writing. Elinor & Marianne are loving sisters but they are contrasted in their responses to every situation. Elinor is the sensible, polite, courteous one who does all the work of keeping up their social relationships with the Middletons, the Steeles, their own half-brother, John & his horrible wife, Fanny, while Marianne is rude to everyone & totally self-absorbed. Elinor's situation regarding Edward is just as hopeless as Marianne's but while Marianne indulges her misery, forgetting to sleep or eat & ruining her health in the process, Elinor keeps up appearances while keeping Lucy's secret from everyone. The scene where Elinor finally admits to Marianne her heartbreak is very moving, as much for the fact that Marianne finally begins to see how selfish her own behaviour has been, as for Elinor's emotional declaration of love & misery. 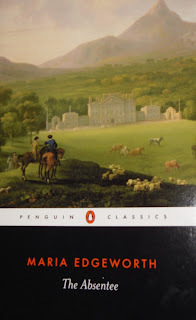 The famous opening chapters when John & Fanny Dashwood discuss how much help they can give his stepmother & half-sisters (ranging from £3000 to an occasional chicken or some vegetables) sums this mercenary, selfish couple up immediately. The minor characters are also wonderful. I love Mrs Jennings. She may be vulgar & irritating but she has a kind heart. Trying to cheer Marianne up with a glass of the best Constantia wine is one of my favourite moments in the book. Mrs Jennings's pretty, flibbertigibbet daughter, Charlotte & her sarcastic, bored husband, Mr Palmer (I must admit I always see them now as Imelda Staunton & Hugh Laurie). Edward's brother, Robert, a fop who enthuses about living in a cottage of palatial proportions & spends hours choosing a toothpick case. Sly, knowing Lucy Steele, engaged to a man she knows prefers another woman but enjoying the fact that she can torture Elinor while having sworn her to secrecy. If I started quoting lines & passages, I'd never stop, so I won't start. If you haven't read Sense & Sensibility, you must. It's an astonishing first novel, although we know that Jane Austen had written a lot of juvenilia & Sense & Sensibility was revised in 1811 from an earlier epistolary novel called Elinor & Marianne. I plan to reread all Jane Austen's over the next few years as the anniversaries of their publication come round. It will a delight & I'm looking forward to it. It's taken me over a week to write this review as I've been preoccupied with two new additions to my household. If I can get some good photos, I'll introduce them to you over the weekend. Homage to Catalonia is George Orwell’s account of his time fighting in the militia during the Spanish Civil War in 1936. I’m not going to even try to explain the political background to the war. Orwell provides two appendices which go into eye-glazing detail about the political machinations between the Communists, the Socialists, the Anarchists, the trade unions & the Government with more acronyms than you can poke a stick at. Briefly, Orwell was one of many socialists who went to Spain to resist the Franco-led Nationalists from taking over the government. Franco was backed by Germany & Italy, both Fascist regimes, & many people were afraid that Spain was just the first step in a fascist takeover of Europe. Orwell was sympathetic towards the aims of the Independent Labour Party & joined the militia of their sister organisation in Spain, POUM (Workers Party of Marxist Unification). Orwell fought as an infantryman for several months before he was wounded & discharged. Whenever it is conceivably possible, the business of today is put off until mañana. This is so notorious that even the Spaniards themselves make jokes about it. In Spain nothing, from a meal to a battle, ever happens at the appointed time. As a general rule things happen too late, but just occasionally – just so that you shan’t even be able to depend on their happening late – they happen too early. In trench warfare five things are important: firewood, food, tobacco, candles and the enemy. In winter on the Saragossa front they were important in that order, with the enemy a bad last. Except at night, when a surprise attack was always conceivable, nobody bothered about the enemy. They were simply remote black insects whom one occasionally saw hopping to and fro. The real preoccupation of both armies was trying to keep warm. The Spanish Government had at last succeeded in producing a decent bomb. It was on the principle of a Mills bomb, but with two pins instead of one. After you had pulled the pins out there was an interval of seven seconds before the bomb exploded. Its chief disadvantage was that one pin was very stiff and the other very loose, so that you had the choice of leaving both pins in place and being unable to pull the stiff one out in a moment of emergency, or pulling the stiff one beforehand and being in a constant stew lest the thing should explode in your pocket. But it was a handy little bomb to throw. Orwell’s laconic irony is the dominant tone of the narrative. The black humour of the ragged militia is also evident as their shoes are eaten by rats, their clothes fall apart, they’re persecuted by lice & the search for firewood & decent food becomes a daily chore. The pathetic state of the militia exasperates Orwell & he grows increasingly disillusioned about the socialist principles that he is fighting for. This is only increased when he goes on leave to join his wife in Barcelona & finds himself caught up in street fighting that erupts because the political situation has changed & the Government now want to suppress POUM. I used to sit on the roof marvelling at the folly of it all. From the little windows in the observatory you could see for miles around – vista after vista of tall slender buildings, glass domes and fantastic curly roofs with brilliant green and copper tiles; over to eastward the glittering pale blue sea – the first glimpse of the sea that I had had since coming to Spain. And the whole huge town of a million people was locked in a sort of violent inertia, a nightmare of noise without movement. The sunlit streets were quite empty. Nothing was happening except the streaming of bullets from barricades and sandbagged windows. .. And all the while the devilish noise, echoing from thousands of stone buildings, went on and on and on, like a tropical rainstorm. Suddenly it was all over. The Government brought in more troops & suppressed the fighting. Orwell went back to the front, this time besieging Huesca. Ten days later, he was shot in the throat. He lost his voice & the bullet hit the nerves in the back of his neck, damaging his arm. After long, jolting journeys in trains with no medical assistance or attendance, he finally comes to rest in hospital & is cheerfully told that his arm will always be useless & he will never get his voice back. Both predictions are fortunately untrue but he does decide to ask for a medical discharge, which he finally gets after much trouble & mañana. On his return to Barcelona, he discovers that the Government has decided to suppress POUM altogether & merge the militia with the new Popular Army. The socialist ideals of just a few months before are now redundant. Orwell regrets this but realises that his only course is to leave Spain. He’s forced to hide out in Barcelona as anyone connected to POUM is likely to be arrested. He & his wife, Eileen, manage to escape across the border to France where he is amazed at how indifferent people seem to be to the conflict in Spain. Homage to Catalonia is a fascinating account of Orwell’s time in Spain. His early idealism is tempered by his experiences but his sympathy with the struggles of the Spanish workers is evident throughout. His pictures of the incompetent army, the ferocious political manoeuvring & the treachery are contrasted with the essential decency of ordinary people that he meets everywhere. His accounts of the fighting, the bravery & the futility, could have been written during any war, its sometimes very reminiscent of the memoirs of trench warfare written after WWI. I love Orwell’s voice in his essays & Homage to Catalonia is written in that same voice. Some of my favourite essays can be found in the collection, Shooting an Elephant. He writes so well about books, reading & English life in the 20s & 30s in essays like Books v Cigarettes, Decline of the English Murder, Confessions of a Book Reviewer & Good Bad Books. I’ve just noticed an essay in that collection called Looking Back on the Spanish War which I must reread. I feel that I now need to know more about Orwell’s life. I’m also ashamed of my complete lack of knowledge about the Spanish Civil War so I should do something about that too. Oh dear, what’s that saying about so many books, so little time? How do you choose your next book? How do you choose your next book? How do you choose your next book? I was thinking about this question the other day (& what word to emphasize when I ask it) as I read another enticing review on a blog & realised I had the book on my tbr shelves. The review was of Clerical Errors by D M Greenwood & the blog was Geranium Cat's Bookshelf. You might ask why I was reading a 5 month old review? 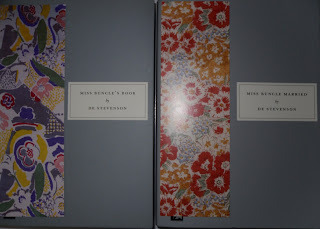 Well, I have a Google Alert set up for D E Stevenson & Geranium Cat has just reviewed Miss Buncle's Book so with one click I was there & I started exploring. That's how I came across the review of the D M Greenwood, working my way through her old posts. 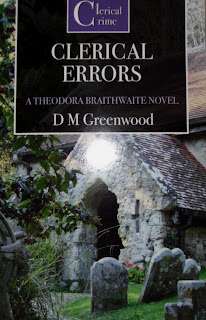 It's not a new title as I read all the D M Greenwoods when they were first published but they've recently been reprinted by Ostara Publishing, who specialize in reprinting clerical mysteries (as well as Oxbridge & medieval mysteries) & I'd bought myself a copy of Clerical Errors some time ago, planning a reread. Having read Miss Buncle's Book some time ago, I really should read the sequel, Miss Buncle Married, both books reprinted by Persephone. I've read the third book in the series, The Two Mrs Abbotts, by accident as I listened to it on audio & didn't realise it was part of the series until Mrs Abbott (née Buncle) turned up. If you have a look at what's on my tbr table (which is one step closer to actually being read), you'll see H E Bates's Fair Stood The Wind For France. I read a review at Reading Matters & was inspired to take it down from its spot on the top tbr shelf where it sits with the other silver spined Penguin Modern Classics. That's a question for another day. How do you organise the tbr shelves? Alphabetical by author? By subject? 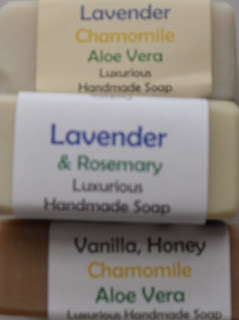 By imprint? In the order they came into the house? 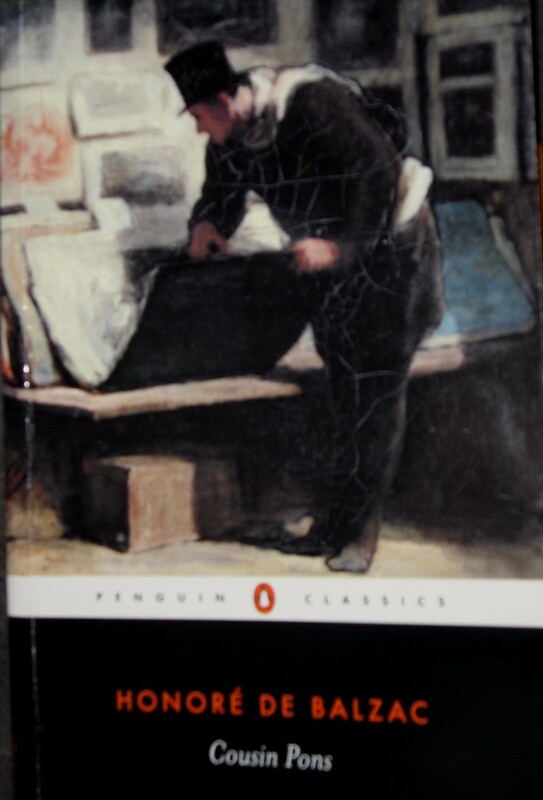 Then, a little while ago, Elaine at Random Jottings was rereading Anthony Trollope & she enthused about his Autobiography so down it came too. Charlotte Brontё's Shirley is there because I loved rereading Villette so much recently that I want to read Shirley again too. Sense & Sensibility is there because I've just finished rereading it to celebrate the 200th anniversary of its publication. I'll be posting about it later in the week. Sir Walter Scott's The Talisman is the latest choice of my 19th century bookgroup. Catherine Carswell's The Camomile was downloaded (free from Open Library) back in April when I read Desperate Reader's review here & there's another enticing review at 20th Century Vox here. 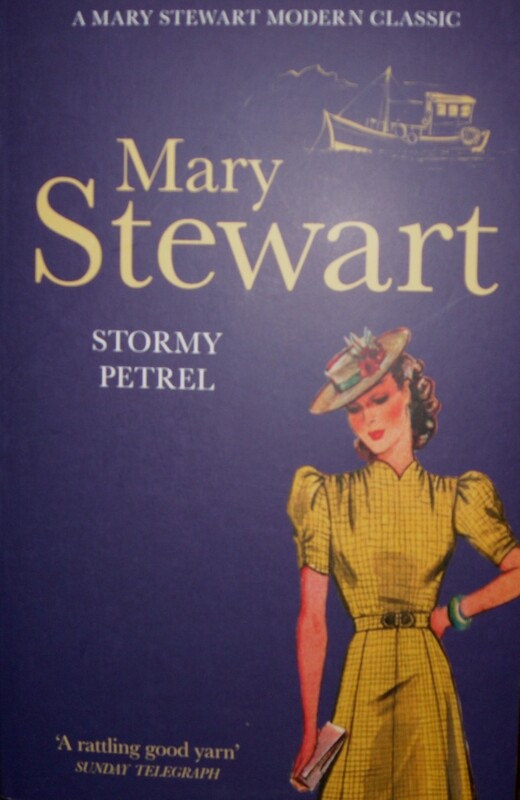 I've been reading lots of Scottish history & fiction lately & Mary Stewart's Stormy Petrel was one of the reprints I bought earlier this year. I downloaded George Orwell's Homage to Catalonia from my library's catalogue of e-books so I only have it for a fortnight. I also downloaded David Kynaston's massive Austerity Britain on the principle that the e-book is easier to read than the 700pp hardback. What was I thinking? I only have two weeks to read both. 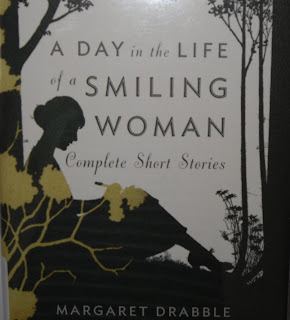 I missed reading short stories after reading so many of them last year so I borrowed the new collected stories of Margaret Drabble, A Day in the Life of a Smiling Woman, & I've been reading a story a day. I've read a few chapters of Margaret Kennedy's Together & Apart but I'm not sure I'm really in the mood so it may disappear from the tbr table, relegated to the tbr shelves. So, how do you choose your next book? I love having so many unread books because it often means I have a copy of that book I've just read about on one of my favourite blogs & I can get it down straight away & have a look at it. Maybe it goes back to the tbr shelves & maybe it makes it to the tbr table. Of course, my next book might be none of these but something that I haven't even considered yet. It might be one of the new Stella Gibbons reprints on the way to me from The Book Depository right now. There's a lovely article on Stella Gibbons here & a review of Westwood here. It might be a book that someone in my online bookgroup raves about. That's how I discovered The Unbearable Bassington by Saki. Now I think of it, I have Saki's short stories on the tbr shelves... Maybe I'll start the Saki stories after the Drabble. At least I will never be in the heart-stopping position of having nothing to read next. Serendipity is a wonderful thing! I visited the local farmers market in Lilydale yesterday morning. It's held on the first Sunday of the month & this was my first visit. It won't be my last as I found everything I wanted & a few little extras as well. Saturday was grey & rainy &, even though I'd planned to visit the market, I did think as I went to sleep to the sound of rain on the roof, that I wouldn't go if it was still raining in the morning. There's always next month. Well, it was a gorgeously crisp, sunny late winter morning so off I went. The morning was the best of the day as it was cloudy & damp by lunchtime. Just as well I brought some sunshine back with me. I couldn't resist those golden daffodils at 3 bunches for $5. 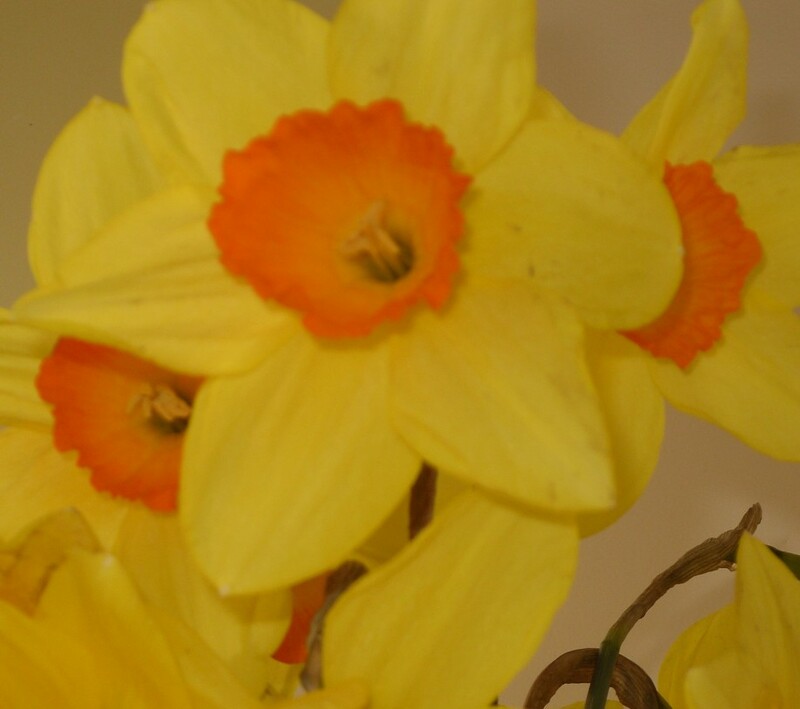 Spring is just around the corner, after all. 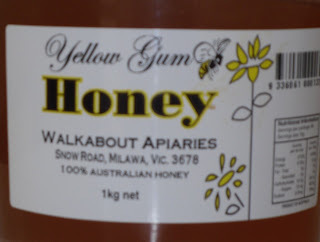 There are some things I always buy at markets. Free range eggs & honey. Fruit & veg. 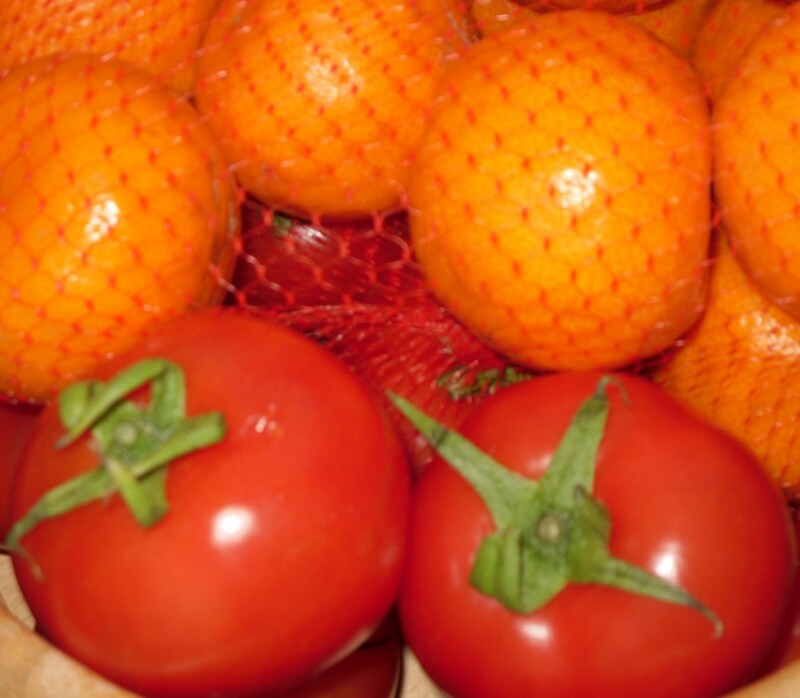 Lovely tomatoes & mandarins. Pumpkin & zucchini for the chicken curry I made yesterday. Far too many carrots & potatoes (but they were so cheap!). Carrot & potato soup, anyone? I also see a carrot cake appearing for morning tea at work in the very near future. Then, there were the treats. I don't eat lots of jam but I always seem to buy it at markets. 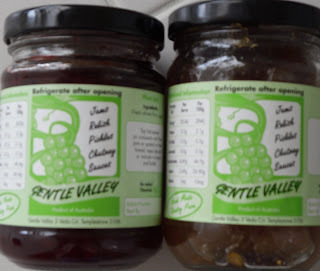 I love fig jam so I bought a jar of that. The other is plum. I have a lovely chocolate cake recipe that includes half a cup of jam so I'll use the plum for that. This week's poem from Scottish Love Poems is about first love. Eric Linklater (photo from here) was born in Wales but identified strongly with Orkney, where his father was born. 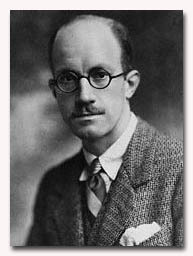 He wrote novels, travel books, history & autobiography. I had vaguely heard of him & then realised that one of his novels, Poet's Pub, was in my boxset of the first ten Penguins. It's one of the still-unread ones, I'm afraid, but I'll get to it one day. Linklater's poem, A Memory, Now Distant, is about unrequited first love recollected long after. That lights the incense-smoke of all belief. Nor, thus bewildered, thought my state amiss. You laughed, and found a fuller life to live. But I was bankrupt quite because of you. 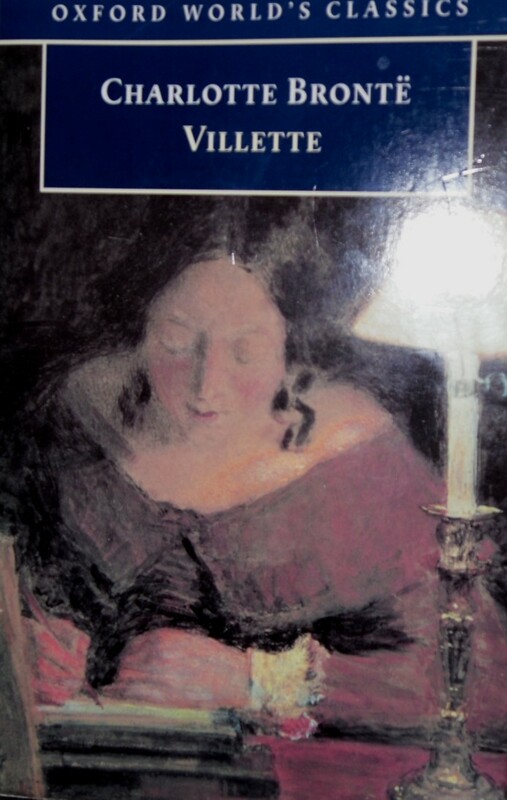 Cousin Pons is the companion novel to Cousin Bette, which I read a couple of months ago. It's the story of another poor relation but Pons is nothing like the vengeful Bette. Sylvain Pons is a hanger-on, a toady who lives for his free dinners at the houses of his rich relations. His other passion is for art. He has been a collector for the last 40 years & his collection of paintings, sculpture & porcelain, which he guards jealously, is full of masterpieces that he acquired cheaply in the junk shops & dealer's rooms he frequents. Pons makes a precarious living as a musician & lives in a few rooms shared with Wilhelm Schmucke, a German musician who is his only friend. Pons's rich relations are philistines who laugh at his obsequiousness & groan whenever he appears for dinner. When Pons gives his cousin's wife, Madame de Marville, a magnificent fan that had once belonged to Madame de Pompadour, she has never heard of the artist, Watteau, whose paintings decorate the fan & tosses it aside as though it was of little value. The Marvilles blame Pons for ruining their daughter's marriage prospects & break off relations with him. Pons's health begins to suffer & he retreats to his apartment & gloats over his collection while he complains about his ungrateful relations. The Cibots are the porter & concierge of the apartment building where Pons & Schmucke live. Madame Cibot is a former oyster-girl, once renowned for her beauty but now gone to seed, although she still attracts the admiration of Rémonencq, a shady dealer in antiques. Madame Cibot is typical of the Parisian concierge of her day - manipulative, greedy & determined to screw as much value out of the people she looks after as she can. She gradually insinuates herself into the lives of Pons & Schmucke, offering to provide their meals for a small consideration, pocketing the money & giving them scraps from her own table in return. Pons & Schmucke are innocents, devoted to each other & oblivious to Madame Cibot's tricks. When Pons falls ill, Madame is determined to feature in the old man's will, especially after Rémonencq & another dealer, Elias Magus, enlighten her to the true worth of the bric-a-brac in Pons's apartment. In league with Doctor Poulain & a dodgy solicitor, Fraisier, La Cibot puts her plan into action. And here begins the drama, or if you prefer, the terrible comedy of the death of a bachelor delivered over by the force of circumstances to the rapacity of covetous people assembled around his bed: people who, in this case, were aided and abetted by the all-consuming passion of a maniacal lover of pictures, the avidity of the egregious Fraisier, who will make you shudder when you see him at work in his den, and the greed of an Auvergnat (Rémonencq) capable of anything, even crime, in order to launch out in business. However, Pons is not entirely unaware of the plots swirling around him & he is not a complete innocent, unlike poor Schmucke, who believes anything he's told. Pons puts his own plans into action as he lies on his deathbed & tries to thwart both his greedy family (who have discovered the true worth of his collection) & the wicked Madame Cibot. Cousin Pons is a wonderful story of Parisian life. Balzac paints a picture of life in both the expensive & the squalid parts of town. The minute calculations of the value of everything, the multiple plots, double crossings & treacheries of nearly all the characters are very entertaining. There's no honour among this group of thieves. As the plots become more involved & loyalties are strained, honour among thieves is never in question. It's every man & woman for themselves. And, as this is Balzac rather than Dickens, not all the bad characters get their comeuppance & not all the good characters live happily ever after.